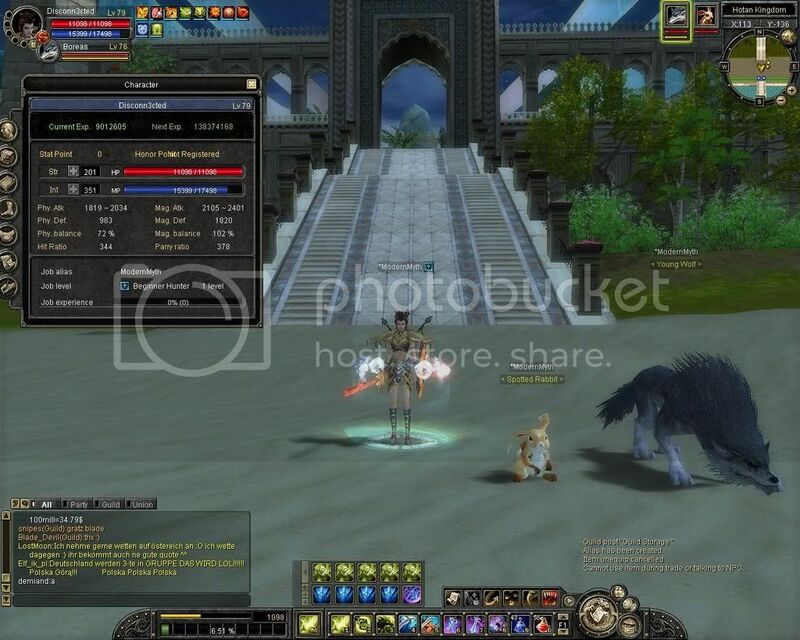 Sos set, one sun peice (53 tasliman), som+6 blade, sos+6 shield. 85+8 Sword, 76+10 SOM Shield, 88+7 Head, 81+7 SOM Chest (I traded it for my 90+5 chest and some gold ) 76+7 SUN Gloves, 86+7 Talisman, 87+7 Boots, 85+7 Ring, 85+7 Ring, 87+5 Earring, 89+6 Necklace. You can't find me on Rev6. And NO, I'm NOT goldbuyer. Last edited by 18andLife on Fri Jun 20, 2008 6:21 pm, edited 1 time in total. 18andlife ... u r not full int ... dont? and u r a alchemy master ... whats ur secret ???? 85+8 Sword, 76+10 SOM Shield, 88+6 Head, 81+7 SOM Chest (I traded it for my 90+5 chest and some gold ) 76+5 SUN Gloves, 86+6 Talisman, 87+6 Boots, 85+5 Ring, 85+7 Ring, 87+6 Earring, 89+6 Necklace. U are garment, and even with full sun garment set u cant have more phy def than an armor set.. And the mag atk, i am pure int with 118% mag balance and with a spear 85+7 i have slightly more dmg than u... thats just impossible since u are pretty hybrid and with a sword. and he's not even buffed or what? Lol. Did you ever hear of Rev6Hider? I still dont trust u, and btw wasnt ur sword +8? lol... Come on show us your rev6 if it's true. Why can u say all the items u've got but cant show ur rev6, uh ? And the damage question is not resolved, its fake 100%. Not to mention that people usually post screenies of their charachter and the rev6 of their charachter to "show off"..now what exactly r u trying to show off Mr Unknown ? Yea, its totally rediculas. Obvious fake. 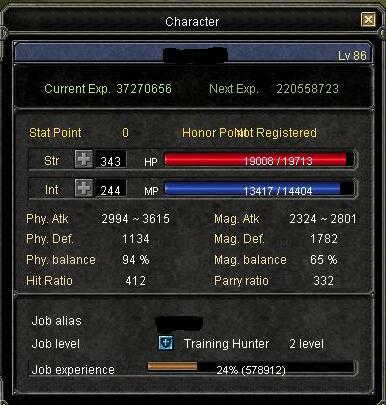 My guildmaster on Alps is level 90 with 85+7 spear and his mag attack is about the same as hers, and he is 7:1 INT, and he has about 12k hp, idk how much MP. Isn's this a lie? Tell me why in ur spoiler u have sword +9? And now explain me how ur mag atk is that high. Answer my questions or stfu.